Astragalus for Testosterone: More ‘T’ from the Far East? Astragalus membranaceus is the root extract of a leguminous (‘pea family’) plant. It’s long been used in China as an immune system booster. ‘Astragalus’ is classified as an adaptogen (like ginseng), meaning it helps the body adapt and normalize its functioning while under stress. Similar to many such herbs, it possesses potent antioxidants, which might be some of the reason for its reported positive effects on kidney, liver, heart, and immune system health. Now there’s some in vitro evidence that it could provide similarly positive effect on testicular health. Since that can lead to higher long-term testosterone production, it warrants consideration as a T-booster. 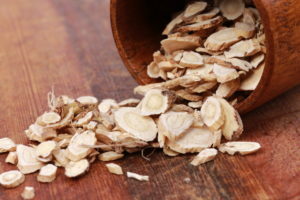 In this article, we’ll look at the research and discuss why astragalus membranaceus might be an effective ingredient in a long-term ‘T’-boosting regimen. As a traditional folk medicine, Astragalus membranaceus (AM) has been widely used in China to treat hepatitis. Although lacking extensive research, it’s likewise been a treatment for diabetic nephropathy, cardiovascular disorders, and skin diseases. During flu and cold season, it’s widely used among Chinese as a defense against those infections. The power behind AM probably lies in its antioxidant, anti-inflammatory, and apotosis-inhibiting properties. That’s what led researchers to hypothsize that it might exhibit positive effects on leydig cells and testosterone. So they purified some rat leydig cells and treated them (in vitro) to different concentrations of AM to observe any changes in glutathione, super oxide dismutase (SOD), testosterone production, and cell proliferation. This experiment was a natural extension to existing research. Test tube studies on rat cells had demonstrated AM’s ability to protect the rodent’s reproductive systems against toxicity. One showed protection of the testes against the toxic effects of cyclophosphamide. Another revealed its ability to reduce genetic damage to spermatozoa from cadmium exposure. In addition, an in vitro study with human cells demonstrated AM’s ability to improve sperm mobility. The researchers were actually testing the effect of AM on the ‘functioning of rat leydig cells.’ In doing so, they discovered increased antioxidant activity and testosterone production at specific concentrations of AM. Surprisingly, they also found that with even higher concentrations, the leydig cells began to increase in number. After purifying and culturing the cells, the researchers added concentrations of 20 – 100 micrograms per milliliter of Astragalus extract. In the range from 20 – 50 micrograms, cellular antioxidant activities of Superoxide Dismutase (SOD) and Glutathione peroxidase (GPx) increased. SOD is an antioxidant enzyme that protects cells from the damaging effects of oxygen radicals. GPx protects them from the damage of hydrogen and lipid peroxides. The leydig cells began producing significantly more testosterone at this range of 50 – 100 micrograms per milliliter. The researchers attributed that to increased antioxidant activities of SOD and GPx. Makes sense, right? Remove some oxidative stress and the cells being negatively affected by it start performing better. What happened next was surprising. When the researchers added concentrations of AM above 100 micrograms per milliliter, the leydig cells began increasing in number. This was attributed not only to increased antioxidant activity, but also to an observed ratio change between two cell-death regulatory genes, Bax and Bcl-2 mRNAs. The researchers suspect it was the increased Bcl-2/Bax ratio from AM that led to leydig cell proliferation. With only a test tube study on animal cells, it’s pure speculation as to whether daily human doses (in hundreds of milligrams) of Astragalus membranaceus will boost long-term testosterone. There’s evidence that it certainly could. The obvious question is whether supplemental amounts would have organ-specific positive effects in an endogenous environment. As with other supplements, a precursor for effectiveness is good general health. A supplement like AM should be used synergistically with improved nutritional and exercise habits, not as an attempted band-aid to cover bad habits that can lower testosterone. Maybe used along with other antioxidants, T-boosting supplements and practices, astragalus could add some antioxidant ‘punch’ to the stack. As far as safety, it’s reassuring that AM has been widely used over time and is taken and recommended by many doctors. Annecdotal as that may be, we’re not talking about a recently discovered herb, and interactions of AM with other supplements and drugs have been established. Some of these effects can be adverse, and Astragalus membranaceus should only be taken with the knowledge and consultation of your personal physician. There’s no current clinical evidence for dosage. However, from 2 to 6 grams daily of the dried root has been recommened. As for capsules of standardized extract, a range of a few hundred milligrams daily to a few grams has been used. My personal opinion is that this supplement might be combined with the probiotic L. reuteri for an interesting ‘stack.’ T-boost notwithstanding, the combination might great for an immune system boost.